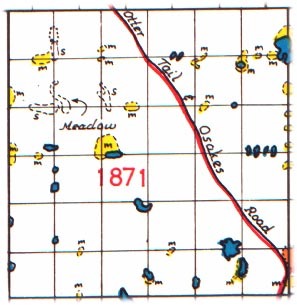 Folden township was organized by the county commissioners on February 24, 1881, in response to a petition signed by a majority of the legal voters of congressional township 132, range 38. The election of the first township officials took place at the house of Ole Larson on the 14th of the following month. The original petition of the voters asking for the organization of the township is not on file with the records of the county commissioners. It has been ascertained, however, that the early settlers included John A. Aldrich, David Noonan, W. M. Conklin, Theodore Thompson, B. P. Johnson, Julius Langnus, Kleber B. Wilkinson, R. R. Wilkinson, Frank Wheeler, Emil Syverson, Martin Oleson, Frank J. Barta, Lars Anderson, Martin Peterson, Johann Larson, Arnt Munson, Hans Nelson, Roland Haagenson, Ole Larson, G. Gesler, Olaf Haagen, G. A. Kallack, C. N. Restad, Erik Larson, Albert Thomas and S. I. Hensing. No village, no postoffice and not even a lake of respectable size is to be found within the limits of this township. When it was organized in 1881 nearly one-half of it was still owned by the railroads while both school sections, 16 and 36, were still owned by the state. Gradually the railroads disposed of their holdings and today they own only a few hundred acres in the township. The branch line of the Northern Pacific runs across the northwestern corner of the township through sections 5 and 6, but there is no station stop in the township. The town hall is in the southwestern corner of section 15. The present township officers are as follow: Supervisors, C. N. Rakstad, Arnt Monson and Ellef Olson; clerk, A. N. Rakstad; treasurer, G. G. Watnaas; assessor, Gunder Gunderson,; justices, Lauritz Larson and Otto Johnson; constables, Peter Albertson and Thorwald Nelson. Places of birth for Folden Township in the 1905 state census.